This plan is a way of adjusting for what economists call externalities. Externalities are costs or benefits associated with a product that are not priced into the product. For example, when I fill my tank with gas, I am paying for many things. I am paying the gas station owner, the trucker who delivered the gas, the refinery, the transport from Saudi Arabia or wherever, the extraction, the surveying, the management of the oil company, some bribes to various government officials (not legally, but probably), campaign contributions to Republicans, etc. All of these factors are reflected in the price. However, the price does not include the harm that will result from global warming, the increased risk of war in the Middle East, decreased air quality in cities, etc. It also does not include unexpected benefits, such as perhaps a better understanding of geology or discoveries of fossils (I’m stretching here to try to find some upside to oil that isn’t included in its price). The harms that result from oil are an example of negative externalities, but there are also positive externalities. If I pay to vaccinate myself, the price reflects the cost of the medical procedure and my individual interest in protecting my health; the price does not include the benefit to others of protecting myself and thus reducing transmission of the disease. In a perfect world, the price of gas at the station would include all of these factors. It would, in all likelihood, become prohibitively expensive, and wind and solar would become feasible alternatives even at their current prices. Likewise, the price of vaccinations would be (and sometimes is) lowered to reflect the public good. But we don’t live in a perfect world, and most externalities are not incorporated into the prices we pay. So we all go about our business, making our individual cost-benefit analyses about prices based on what things are worth to us, and failing to incorporate all these side effects of our purchases into our decisions. (In some cases, consumers do buy “green” products, so this is not always true, but is still generally true.) Externalities are thus one of the major limitations economists see to a pure free market. How would externality insurance work? The broad idea I have proposed is perhaps easy to agree to, but the devil is in the details. What sorts of projects should be required to purchase insurance? How much? What sorts of externalities are covered? How do non-monetary harms get quantified in terms of pay-outs? All of these decisions would have a major effect on whether or not such a program worked. One of the crucial details is how externalities get quantified in the event of a disaster. 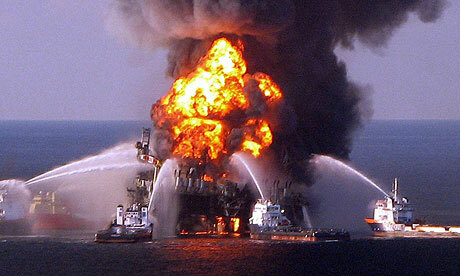 Let’s take the example of BP’s Deepwater Horizon oil spill. The goals of the policy would be to (a) help prevent such disasters by reducing the costs of insurance for projects that are well-managed and safe, and (b) make sure the full costs can be recovered, without worrying about legal battles, standards of evidence, and things that are hard to quantify (all of which can lead plaintiffs to settle for much less than the true value of the harm caused). Accordingly, there should be large payouts to governments (national, regional and local) that reflect the general enviornmental damage that does not have a direct economic cost, such as loss of reef habitat, declining dolphin populations, etc. These payments should be large enough to have a substantial impact on the cost of the insurance, since the goal is not to compensate nature but to prevent disasters by ensuring better practice. However, they should not be so large as to completely eliminate the possibility of development projects – society has many interests, including both conservation and economic development, and the price should reflect the balance among them. Obviously, this is subjective and would be the subject of fierce debate between environmentalists and industry. There are also direct economic costs. For example, after the BP oil spill, tourism declined, fishermen were out of work, restaurants may have had fewer customers ordering fish dishes, property owners suffered damage, some individuals may have health claims, and so forth. All of these should be paid directly to the affected individuals and businesses. One of the challenges would be to determine what level of proof is required for a payout. My instinct is that the standard should be relatively low, but that there should be very stiff penalties for filing a fraudulent claim. Indirect economic costs are harder: for example, a clothing store owner in a fishing village may have fewer customers, construction may slow down, etc. There is no completely fair way to reimburse these costs, but it should be possible for economists to estimate total economic losses. These losses should be paid out to affected governments, perhaps in proportion to their per-capita budget size or tax burden. These governments should be required to use the funds to pay down debt or reduce tax burden, so as to ensure the maximal return of the funds to affected individuals. One critical aspect of how the program would function is that it would allow insurers to become directly involved in project management, including the requirement of various safety measures, on-site inspections, etc. This would drive up the costs of operating such projects, approximately proportionally to real costs they impose on society. In some cases, this would change the cost-benefit analysis and certain projects would no longer be carried out because they would be seen as too risky or not profitable enough for the additional price of the insurance. That’s OK – it might slow some development, but it would also prevent future economic losses and help ensure that any losses are fairly distributed to those affected. The whole point is that if the cost of externalities is quantified well, the program will by definition improve the economy. An insurance company that stands to lose billions of dollars in the event of a disaster has a strong incentive to provide good oversight. In many cases, they may want to pay the salary for someone to be located on-site full-time, ensuring good management and safety practices. Currently, oil companies or others that manage such projects have mixed incentives: they do stand to lose some money in the event of a disaster, but they may be able to escape many of the costs through litigation, and they also have an incentive to cut corners and maximize profits. Also, workers may have a tendency to become numb to risk that they experience daily, and may cut corners as a result. Outside enforcement could help manage this risk. What do you think? Would this plan work? Might it have prevented past disasters? How can we get the balance right between requiring substantial payments and not being so excessive that we stop even reasonable economic growth?